Dementia is usually a languid condition, often meandering along for well beyond a decade. But there are exceptions, as Marissa Bresnahan can attest. Now a staffer at the Massachusetts-New Hampshire chapter of the Alzheimer’s Association, Marissa has witnessed her mom’s stark decline over the past four years. When Marissa and I discussed her mom, Tina, the portrait that Marissa depicted of her mother bordered on Supermom status. For three decades, she worked as a pharmaceutical representative. She raised five children, all boys, with the exception of Marissa. And her children-rearing went beyond her own kids. Marissa was the first member of the family to notice that something was wrong. She was a freshman in college, and when she came home that Christmas, Tina had recently suffered a pulmonary embolism. “It was a big deal. She was on blood thinners. I was really freaked out.” It was then that Marissa started noticing changes in Tina’s personality. “Maybe it took me to go away to college to see the change.” Marissa added: “She was always funny and had a mouth like a sailor, but now she started to be cruel and inappropriate in some of her comments. A stranger would walk by, and she would say, out loud, ‘that woman needs to lose weight.’ And, ‘How can she stand to be that fat?’” But everyone else in the family tended to attribute Tina’s problems to the embolism. As is common with dementia, getting a diagnosis can take time. During her senior year in college, Marissa came down with mononucleosis, and Tina arrived with a bowl of turkey meatballs. At that time, Marissa was not eating red meat, to set an example for her dad, who had been advised to eat more wisely. Tina was insulted that Marissa wouldn’t eat the meatballs. She chose to freeze them. Every day, her mother would call and ask, “Did you eat the meatballs? Did you eat the meatballs?” Even after Marissa ate the last of the meatballs, Tina kept asking about them. At that time, Tina was still driving, but erratically, sometimes ignoring stop signs and traffic lights. The Bresnahan family is based in Pennsylvania, and during a road trip to New York she drank almost two bottles of wine—this for a woman who is only five-foot-one. She ended up vomiting on herself. She had no history of binge drinking. Around this same time, Marissa informed her brothers, “Mom’s acting like a crazy person.” But her brothers claimed that Marissa was just being mean. “And that I didn’t know what I was talking about.” One of the brothers suggested that Tina was going through menopause. Marissa rejected the notion. But she shouldn’t. Few researchers are claiming a major breakthrough is just around the bend. But in a couple of decades? So long as research money, both public and private, keeps flowing in the service of curing the assorted forms of dementia, it seems plausible, even probable, that people now in their twenties will live to see Alzheimer’s become a managable disease. 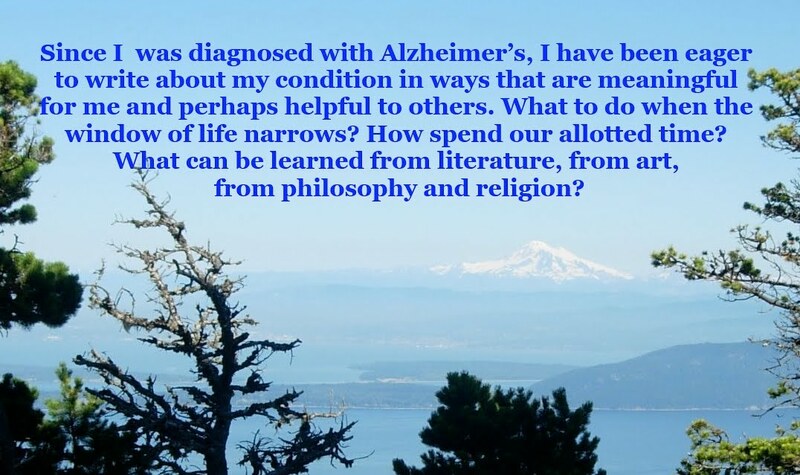 When I first started writing about Alzheimer’s, I already knew that women were more likely to develop the disease than men. This seemed commonsensical, since women tend to live longer—about six years longer, on average. The point was driven home by Maria Shriver during the national meeting of the Alzheimer’s Association national meeting in March in Washington, who made clear that 65 percent of people with Alzheimer’s are women. Shriver’s father, Sargent Shriver, a prominent figure in the Kennedy and Johnson administrations who lived past 90, was somewhat of an outlier. Maria Shriver cared for her dad through the culmination of his long life. In a May 10 article for the health and medical news service “STAT: Reporting from the frontiers of health and medicine,” reporter Roberta Diaz Brinton commented, “While caregiving for loved ones with dementia can certainly be meaningful, dispiriting routines such as toileting, undergarment-changing and bathing are enduring challenges. Lack of daily predictability in dementia-linked symptoms intensifies the burden.” Not surprisingly, women are typically the primary caregiver for the person’s loved one, and the stress of providing the care can take a toll on the caregiver. Diaz Brinton was not the only writer to highlight absenteeism recently. Another article about the disproportionate role of women as caregivers appeared this week in the Journal of the American Medical Association [JAMA]. Written by Nicholas T. Bott and two other researchers, the writers point out that women provide roughly two-thirds of all elder care. The statistics are stark. Daughters are 28 percent more likely to be caregivers than sons. As the JAMA article notes dryly, “The best long-term care insurance in our country is a conscientious daughter.” Eighty-three percent of caregiving comes from family members. As a result, caregivers often feel dispirited, if not downright exhausted. And with a new administration in place, federal funding for caregivers are likely to be a low priority, at best. One novel approach developed by the Obama administration would enable Medicare Part E to allow seniors to “trade reduced acute inpatient for new long-term care.” It’s an intriguing idea. But with the Trump administration in a state of siege these days, it’s hard to imagine the Medicare Part E plan coming to fruition. Here is one definition of “neuroplasticity”: The brain’s ability “to reorganize itself by forming new neural connections throughout life.” Neurons, also called nerve cells, can compensate to some extent for head injuries as well as neurological damage caused by diseases such as Parkinson’s and Alzheimer’s. At one time, scientists thought that neurons (nerve cells) were finite. But now we know there are ways to continually give birth to neurons throughout one’s life. Earlier this week I paid $8 to obtain an article in the venerable British science journal Nature, titled “Probing plasticity.” But I would be lying if I claimed to fully understand this text. It was written in a scientific dialect that would have taken days, maybe weeks, for me to learn. At the other end of the spectrum, I consulted the website Neuroscience for Kids, which noted that the human brain has roughly 100 billion neurons at any one time. An interesting fact, but one that failed to illuminate neuroplasticity. Elsewhere, I learned that DARPA—the U.S. Defense Advanced Research Projects Agency—plans to collaborate with seven public research universities to develop better ways to explore how “stimulation of the human body’s peripheral nerves can help facilitate cognitive learning.” In the fifteen-plus years since 9/11, many soldiers have been diagnosed with traumatic brain injuries. Two studies completed in the early years of this century have proven illuminating. In the first study, published in 2000, established that taxi drivers in London needed three to four years to master all the routes within the metropolis. In a second study (2003), the researchers concluded that the immense time the drivers spent on the road over the years increased their brains’ gray matter, making them, for want of a more precise term, more intelligent. Particularly impressive were the gains in short-term memory, which resides in the bilateral hippocampus—the part of the brain that, in cases of Alzheimer’s, typically experiences the first effects of the disease. For the legions of veterans who have sustained serious brain injuries in combat in Iraq or Afghanistan over the past fifteen years, neuroplasticity is a crucial concept. According to the medical definition of plasticity, the brain has the ability “to reorganize by forming new neural connections throughout life.” Neuroplasticity allows nerve cells in the brain and adjust their activities to new situations or to changes in the environment.” In other words, some brain damage that once would have regarded as permanent now can be treated. I was raised Catholic, but tended to let Christian Doctrine go in one ear and out the other. For many years, as a young adult, I gave little thought to religion at all. A childhood friend had died in a mountain-climbing accident at age eighteen, the first death that really mattered to me. Because I was out working on my dad’s commercial fishing boat on the day of the funeral, I couldn’t’ attend. I didn’t behold a corpse until I was twenty, a former football teammate of mine, killed while driving at high speed along a lake. It wasn’t until Paula was pregnant with our first child did I think much about going to church. We made a point to baptize our son in a timely manner, as a kind of spiritual insurance policy. Eventually, we moved to another Episcopal church, this one within walking distance of our home. For years, my attendance was sporadic. Back when I was working full-time, Sunday morning was my time for writing. I would get up fairly early, and sometimes write for four or even five hours. I envied writers and other artists who had a spouse who was the primary breadwinner. And, then, suddenly, I got my wish: I wouldn’t have to work. It came at the price of Alzheimer’s. My disease is known for eroding one’s powers of concentration. And that is one of the reasons why I aim to attend church weekly. I seek structure in my days, even on Sunday. I rarely find the correct hymn in time to join the rest of the congregation, and tend to fall behind in reciting the liturgy. In those moments, I just mumble along, usually a bit behind the rest of the congregation. I often gaze into the church’s nave, with its massive, darkly stained timbers, built in the nineteenth century. The nave is especially striking when sunbeams illuminate the motes. For decades, journalists have highlighted the political power of the “religious right.” One of my early assignments for my college newspaper was to cover a rally by Jerry Falwell, the founder of the Moral Majority, a vaguely Orwellian turn of phrase: not a majority, and a dubiously selective morality. This was in early 1981, just a couple months after Ronald Reagan was inaugurated. Falwell quipped, “In the Bible, it was Adam and Eve, not Adam and Steve.” His audience tittered. Much less often do you hear about a “religious left,” but there has been such a thing since the decades leading up to the Civil War. Quakers have practiced non-violence for centuries. I somehow managed to avoid reading Uncle Tom’s Cabin until this spring, and I found it eye-opening. There is a reason why Harriet Beecher Stowe’s novel has outsold every other book except the Bible. Her novel depicts the horrors of slavery in the decade leading up to the Civil War as no other book has. And, most sadly, even after Martin Luther King’s historic accomplishments, even after eight years of a black president—perhaps because of a black president—the “Black Lives Matter” movement is vitally needed.